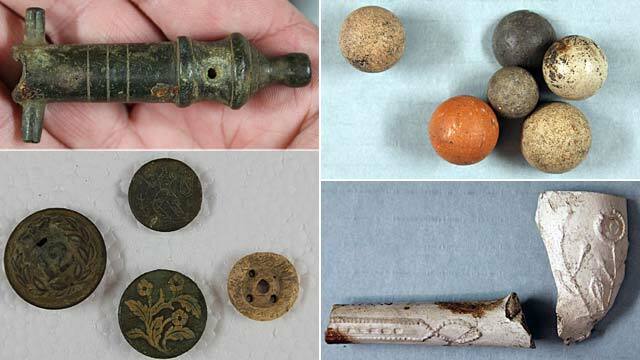 Relics found at the Port Arthur Historic Site include, clockwise from top left, a miniature model cannon, a collection of marbles, a clay pipe bowl and stem, and engraved uniform and dress buttons. ARTEFACTS unearthed at the Port Arthur Historic Site nearly four decades ago have finally been analysed and the findings have surprised archaeologists. The items, including toys, lace-making tools and crockery, had been hidden away in boxes at the site because of tragic circumstances. But the invaluable pieces have at last been dusted off and the historical information they have revealed has changed experts' understanding of life at the penal colony. The belated analysis has also brought the work of a promising young archaeologist to fruition. In the 1970s University of Sydney archaeology student Maureen Byrne uncovered the amazing collection of artefacts from the first prisoners' barracks at Port Arthur. Considered "the next big thing in Australian archaeology", Byrne dedicated her PhD studies to the buildings, the first prisoners' barracks in Australia, and also known as the "lunatics' and paupers' barracks". Hers was the first structured excavation there. But sadly the promising 24-year-old died as a result of a severe asthma attack before she was able to undertake a second excavation at the site. Her findings were locked away for safe keeping before they could be properly analysed. "I think her death possibly affected the rest of the archaeological community to such an extent that no one really quite felt comfortable continuing the work ... it was always meant to be Maureen's PhD," said the university's senior archaeology lecturer Martin Gibbs. But in July this year eight University of Sydney students spent a fortnight meticulously sorting through Byrne's collection, re-bagging and cataloguing each item. It was a moving experience for the students, many of whom are about the same age as Byrne was when she worked at the site. They discovered surprising artefacts, which seemed incongruous given the history of the barracks, including lace-making bobbins, military buttons and a toy brass cannon. Dr Gibbs believes the new research has revealed a possible new side to the history of Port Arthur. "Mostly when people talk about women and children at Port Arthur they talk about them being on the outskirts of the site, but we've got evidence of children, and we assume that means families, very close to where the convict activity is happening," he said. Dr Gibbs said prisoners were originally housed in the barracks but were later moved into the main penitentiary, which was converted from a granary in the 1850s. "I think what happened then and this is a gut feeling based on the artefacts -- is that the barracks building was standing more or less empty and they probably moved military families in, possibly while they were constructing other housing for them," Dr Gibbs said. "This makes for a very different take on Port Arthur as the 'convict prison' when you have women and kids living in the heart of the settlement." He said the stories of Port Arthur tended to focus on the hardened criminals detained there and the horrific punishment they endured. But these artefacts showed there was far more going on at the site than brutal punishment. "[The site] has been represented in a fairly narrow sort of way but this was a far more complex place than the stereotypical story that is presented," Dr Gibbs said. The Port Arthur Historic Site Management Authority's archaeology manager David Roe said original illustrations and records lacked critical detail and the artefacts helped fill in some details. 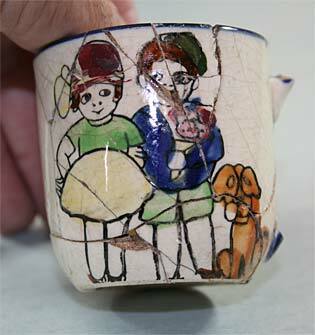 However, some pieces raised more questions than answers, such as a hand-painted cup from a doll's tea set, which appears to be from the post-convict era, possibly the early 20th century. "The work that took place this year is the start of what's going to be a long process," Dr Roe said. "There's an awful lot of bone material that we haven't even started to analyse yet." He said the bone collection could shed some light on how prominently native animals featured in the convicts' diet alongside government provisions such as salt beef. Ian Jack, the former dean of the arts faculty at the University of Sydney, was engaged to Byrne at the time of her death and considered himself a "trustee" of the artefacts she discovered. He said it was a thrill to see them investigated at long last. "It's exciting that after such a long period [Byrne's research] has emerged as something really worthwhile, and has been a very useful collaboration between a major world site and the university," Associate Professor Jack said. He believed Byrne's collection went against some of the "touristic" perceptions of Port Arthur. Slate fragments might be evidence of illiterate prisoners starting a school, he said. "Archaeology is very good at giving information about people who are not individually very well documented," Associate Prof Jack said. "This comes a little bit closer to seeing them as people." The Port Arthur Historic Site Management Authority has yet to decide how best to display Byrne's collection, of which several hundred items are still yet to be properly identified. Dr Roe said he hoped to see a second excavation at the prisoners' barracks, as Maureen Byrne had always planned.